I truly can't believe that I have a seven month old!!! The time truly is flying but I can't even be sad about it because Samuel is just so much fun. He is the most smiley, giggly little boy and brings so much joy to not only Preston and I but also our whole family and everybody he meets! He has the opposite of stranger danger, basically if you are within three feet of him chances are he is smiling, cooing and raising his eyebrows at you trying to engage in a conversation! I truly love seeing his personality continue to emerge and have to pinch myself regularly - I don't know how I got lucky enough to be his mom but I am so thankful I did! Likes: People! Like I said above, he is completely my social butterfly and wants to constantly be surrounded be people who are talking and smiling at him. Swings. He loves our park time and giggles like crazy on the swings, especially when there are big kids swinging next to him. Grass. We go on a walk to the park almost every night and set out our blanket and as quick as we put Samuel down he finds a way to shimmy to the grass. He loves touching it, sitting in it and rubbing his face in it (trying to sneak a few bites, I'm sure). We are getting quotes right now to have new grass laid in our yard and I can't wait to enjoy it more once it is complete! Food. The past month has been our first foray into solids, but he is really liking it so far - more on that below! Toys and Books. Before I had Samuel I really did not realize how early on babies love toys. 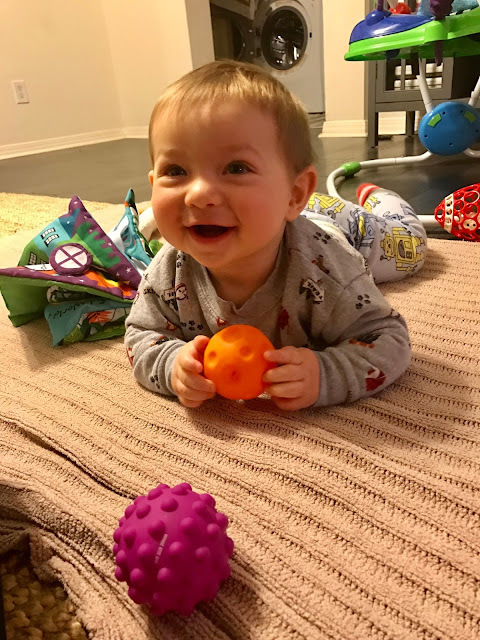 We have lots of play time in our day and his favorites seem to be his sensory balls, Sophie the Giraffe and any and all books (I read them to him daily but he seems to love them most to chew on ;). His very favorite things to play with though are the laundry basket, his diaper wipe container and house plants - ha! Just so I can remember, our favorite books we read every day are Where Ever You Are My Love Will Find You and I Love You Mom (which I can't seem to find online but is so sweet). Mom and Dad. Ok, I may be biased but I think it is the absolute best how much Samuel loves Preston and I. In the morning when I get him up, he looks at me like I hung the moon and then will wrap his little arms around me so tight and regularly plants huge, wet kisses allll over my face. With Preston, their relationship is so playful and nobody in the world can make him laugh as hard as P does - it is hilarious to watch! Dislikes: Sleeping (Samuel has a major case of FOMO and hates to miss out on the party! ), getting his face cleaned and not being able to crawl. He is trying so very hard and making all sorts of cute noises, and while he is close, he still only manages to army crawl backwards and gets further away from the item he wants which makes him very angry (and makes this momma laugh at his fiery little temper). All in all, he is such a relaxed baby and not many things upset or bother him. Stats: We weighed him when he was about 6.5 months and he was 22.5 lbs - our BIG BOY! We haven't measured him, but I know he is growing quickly because he has outgrown all of his clothes! Right now he is wearing 12 month and 12-18 month clothing and a size 3 diaper (which we will be sizing up very shortly). Eating: This month was so fun to introduce food! We've taken it slowly just to watch for any reactions but Samuel has been really great about it. We gave him his first solid the day he turned six months and it was avocado - these pictures/ video still crack me up. As you can see, he loves to blow raspberries so for the first couple of weeks of eating about 50% ended up in his mouth and the rest was blown on his tray and me. ;) So far he has tried avocado, sweet potato, banana and pear. Truthfully we keep it easy and just feed him what we have on hand and those are pretty much staples at our house! He still continues to nurse every 2-3 hours during the day and at least 3 times a night. He is incredibly distracted during the day so gone are the days of being able to nurse him anywhere and get a good feed. I try to time it so he eats when we are home, and even then he continues to get distracted by everything! I am glad he is a curious little man but I will be happy once we can get his calories in during the day and get rid of some of those night time feeds! This is the most unflattering picture of me ever, but SO real life so I had to include it! Firsts: First international plane flight! At the end of his six month, we flew to London for our family trip! I will post more details on his next update, but he did really good and we had such an awesome time. He is getting up on all fours and is so close to crawling. He wants to so incredibly bad, and if it was mind over matter he would be scootin' all around town! He has pretty impressive mobility with his army crawl/ moving in a circle. He also cut his second tooth (not too long after the first) and looks so cute with them. He did bite me for the first time while nursing which was not fun and has thankfully stopped since then. 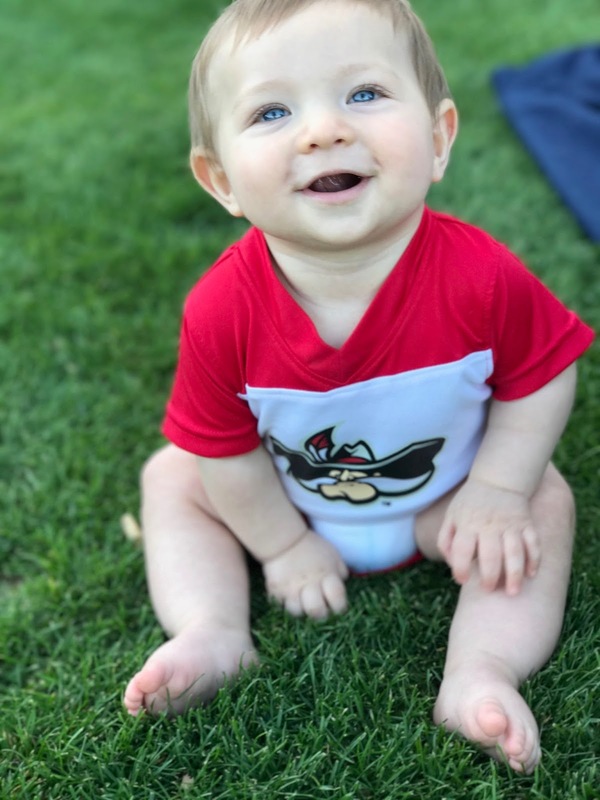 He celebrated his first Super Bowl, Valentines Day and his great-Nana's birthday! Parents: We really are doing great. I feel like every month we get more into our parenting groove. Life as a family of three really is so sweet and I am really trying to focus on enjoying every day. 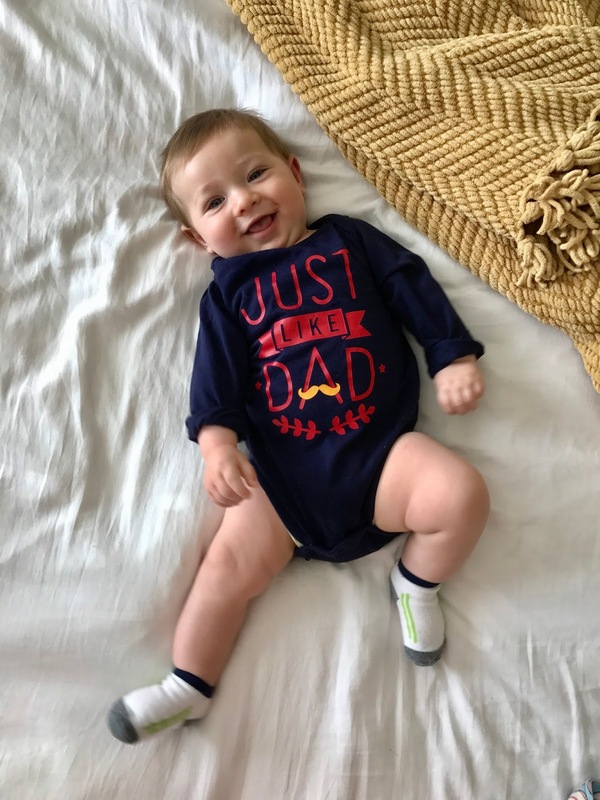 I want to soak in all of the sweet moments: Samuel giggling on the swing at the park, Preston hopping like crazy just to get a giggle out of Samuel, my mom's eyes when she sees Samuel and he flashes his big grin at her, our beautiful neighborhood on our walk... I am getting a little emotional writing it out because this is truly such a sweet time in our lives and I never want to forget it!